SelgasCano, 6a Architects and David Kohn Architects are among the eight architecture studios creating buildings for a purpose-built design district at the heart of the new Greenwich Peninsula development in London. The new one-hectare design district will provide a permanent base for over 1,800 of London’s creatives across a range of affordable architect-designed workspaces at the centre of the riverside site. The design district set within the Greenwich Peninsula scheme, which is being overseen by developer Knight Dragon, will be anchored by 16 buildings. Eight architecture firms including 6a Architects, Mole, Architecture 00, Barrozi Veiga, SelgasCano; Assemblage, Adam Khan Architects and David Kohn Architects will design the buildings, while landscape architects Schulze+Grassov will create the public realm. Each firm was asked to design a pair of buildings independently and "blind" from each other in order to create a "provocative diversity of colour and form". The juxtaposed buildings, which will house "low-cost, human-scaled" workshops, artists studios and flexible desk space, will be set around a series of courtyards and a central public square. The district is to be fully pedestrianised and a transparent market hall will sit at its heart. "Open house" workshops, rooftop terraces and a basketball court will be open to visitors while retail design studios will house a rotating showcase of work created by the local designers. Knight Dragon said that studio rents, averaging at £25 per square foot and workshop space starting from £10 per square foot, will "answer the call for more affordable workspaces in the capital". 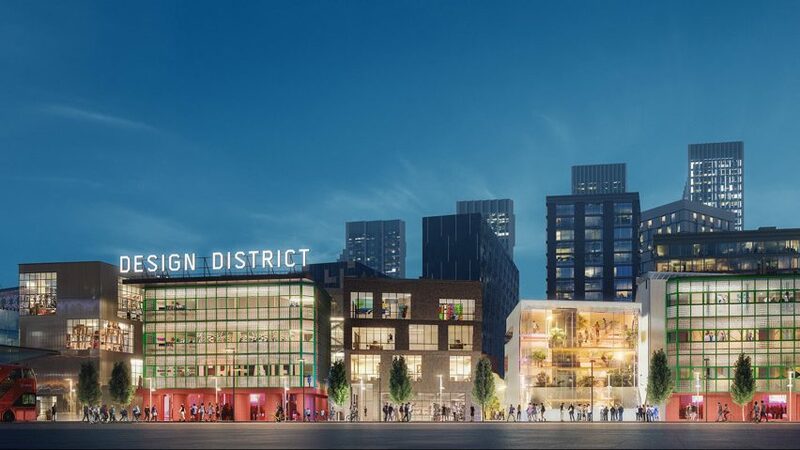 The creation of the design district is the latest phase in Knight Dragon's 20-year development of Greenwich Peninsula – one of the largest regeneration projects in London. It will be delivered in a single phase and be open to its first tenants by early 2020. "Creativity is what drives forward any thriving city," said Richard Margree, chief executive of Knight Dragon. "The Peninsula presents a unique chance to create a new permanent district designed by creatives for creatives." "At the very centre of this new community will be artists mixing with start-ups, mixing with independent market traders and design companies, large and small; everyone is welcome," he continued. "We want a real mix of companies to come and to take over the place." As well as a new design district, the £8.4 billion Greenwich Peninsula development, which is masterplanned by British architecture firm Allies and Morrison, is to include 15,720 homes, a film studio, a new mixed-use tube station by Santiago Calatrava, schools, offices and healthcare services.